The Auburn & Syracuse RailRoad was one of the earliest railroads chartered and constructed in New York State. It ran from Auburn to Syracuse via Elbridge and Camillus. The following is information gleaned from various sources by Richard Palmer. Commentary by Mr. Palmer will be in italics. 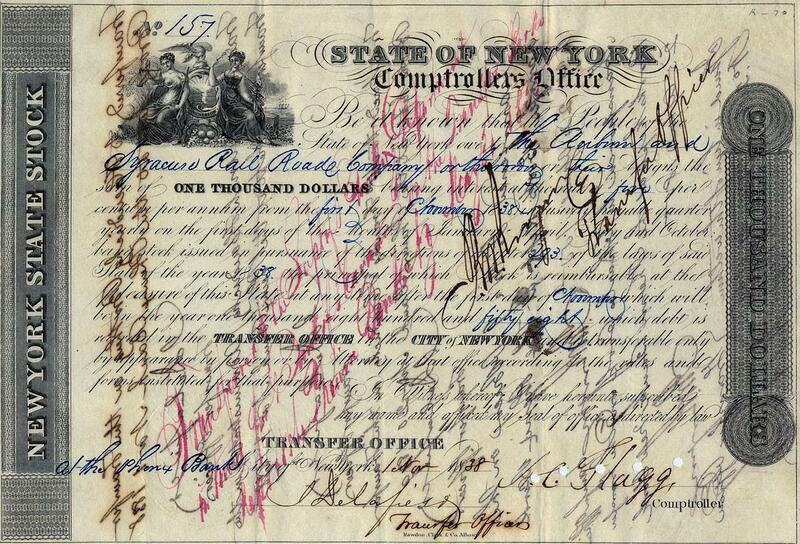 The above is a note stating the State of New York owed the Auburn & Syracuse Rail Roade [sic] for $1000 at 5% per annum. It also states "being stock issued in pursuance of the directions of Chapter 293 of the laws of said State of the year 1838..." and is dated November 1, 1838. In December, 1837, the Auburn & Syracuse Railroad Co. contracted with Col. John M. Sherwood of Auburn to operate the railroad using his horses and altered stagecoaches until such time as the company could afford and/or procure locomotives. At the time, strap iron was also unavailable, so locomotive operation would have been impractical on plain wooden rails. Sherwood was one of the major partners in a consortium loosely called the "Old Line Mail," which had controlled public land transportation between Albany and Buffalo and had the mail contracts since about 1800. According to Thomas Y. How Jr., treasurer, as recorded in the company letter book, the directors had decided it was in their interest to contract with Sherwood and also secure his business rather than compete against him. This arrangement lasted for about 14 months until locomotives were purchased from Rogers, Ketchum & Grosevenor of Patterson, N.J. I have often wondered if Mr. Grosevenor, or a relative, was responsible for the founding of the National Geographic Society. On Monday [Christmas] we, upon the invitation of Col. Levi Lewis, the indefatigable agent of the railroad, in company with the president and several directors of the company, and several other gentlemen of our village, in all about 50, took a trip on this road. The company has two splendid passenger cars, of which 24 passengers can be seated with ease. The party left the depot in the village at 10 minutes past 11 A.M., and in 40 minutes were eight miles from town. The horses were then changed and we continued five miles farther, which is as far as the road is entirely complete - although it is nearly finished to the Canal at Geddes. After returning a short distance the party partook of refreshments which were abundantly provided before the party left Auburn. They then returned to this village, where we arrived at three o'clock, all highly delighted with the trip. It was truly a "Merry Christmas." Exclusive of stoppages we traveled about ten miles an hour. Each car was drawn by two of Col. Sherwood's best horses. This important work is now nearly completed, and is put in running condition as far as the Erie Canal [in Geddes], a distance of 23 miles. We understand that it was opened on Monday for the transportation of passengers and property, and is to be run for some time by our energetic fellow citizen, Col. Sherwood. On Monday a large number of citizens was gratified with an excursion upon this road to Syracuse. As far as we have heard, all express themselves highly pleased. All was joy and hilarity of the prosperity of the speedy completion of this "link" which is to connect us still closer with the commercial interests and prosperity of New York. The expedition was performed with reasonable clarity upon the road by horsepower. After dining at Mr. Rust's [ed. Philo Rust was proprietor of the Syracuse House] the party returned in fine spirits. One word as to this road. It has been pressed through the embarrassments of the last season with energy and perseverance which reflect great credit on the Agent and Directors of the company. Its completion should be hailed by the citizens of Auburn as affording the prospect of profit to those who have staked their personal character and their property upon its construction, and as the true pledge of the future prosperity of our beautiful and rapidly increasing village. This road is now completed 22 1/2 miles and on Monday, Jan. 8th, a party, composed of the stockholders of the Company, and several citizens of our village, upon the invitation of Col. Levi Lewis, the Agent, traveled over it the entire distance. Five cars crowded with passengers left the Depot in the Village about half past 9 A.M. About half way down, we met a car, loaded with citizens from Syracuse, which returned with us. The road passes through a most beautiful and romantic country. In the vicinity of the Nine Mile Creek, the scenery is truly sublime. Near the creek, on both sides of it, the road passes through inexhaustible beds of plaster through which a passage has been excavated at great depth in preparing for the superstructure of the road. The Company have [sic] about 40,000 tons of plaster ready for transportation, which is worth $150 a ton. The Company owns 250 feet in width through the plaster mountain, and when it is understood that 40,000 tons were retained from the track of the road, some idea can be formed of the vast quantity of plaster owned by the company. The party arrived at the road's termination at about 12:30 P.M. having stopped several times to view the scenery. The Company have [sic] made arrangements with Col. Sherwood to run cars, both directions, as far as the road is completed, to July next. Of the manner the party traveled from the termination of the road, to Geddes and Syracuse, as there were not half carriages enough for their conveyance, and of the dinner, &c., we shall omit to speak for reasons known to the party generally, especially to those who were left to last in getting at Rust's. The party returned, and arrived at Auburn at 8:45 P.M., much pleased with their ride on the Rail Road. Following is an account of a ride in one of the horsecar trains from James S. Buckingham's "Travels in the Eastern and Western States of America," (P. 480) published in London in 1842. The author and his party had traveled by canal packet to Utica, and then by stagecoach to Syracuse. He noted that the journey from Utica to Syracuse, a little more than 50 miles, took eight hours, from 8 a.m. to 4 p.m., or an average of 6 1/4 miles per hour. "On the following morning, Thursday, August 9th , we left Syracuse in a coach that conveyed us to a rail-way, beginning at a distance of 3 or 4 miles from the town, to take us to Auburn; but great was our disappointment at finding, that instead of a locomotive engine, the cars were drawn by horses, of which there were only two, to draw about 20 passengers, the horses being placed one before the other, as tandems are driven, and not abreast. "The rails, too, were of wood instead of iron, and the rate of travelling was estimated to be about 6 miles an hour. We had to wait half an hour before starting, and our progress was then so tedious that we all thought of getting out to walk the distance, as the most expeditious mode of the two, when, to add to our mortification, we met a train of cars drawn by a single horse coming right against us, and, the rails being single, and the places for turning off being wide apart, we had to shift our tandem pair from the front to the hind part of the train, and be drawn back about a mile and a half to get off the track, and let our advancing rival go past us. "After a very tedious ride of four hours in performing 22 miles, we reached Auburn, the entrance to which was by the great State Prison, and the other public buildings, which gave it a very striking appearance." From Notes on the United States of America During a Phrenological Visit in 1838-39-40. By George Combe. Vol. 1 p. 71. (Carey & Hart, Philadelphia, 1841. June 7, 1839. Thur. 58 degrees. Railroad from Syracuse to Auburn. - This railroad was opened only on the 5th of June, and we traveled on it the third morning of its operation. It was not enclosed, and the domestic animals along the line had not become accustomed to the appearance of the locomotive engines and trains. It was a curious study to mark the effects of our train upon them, as it rushed past. The horses in the fields generally ran away, carrying their heads erect, and their ears bent downwards and backwards; and they turned their heads alternately to the one side and the other to catch a glimpse of the dreaded enemy behind. One horse, however, turned to us, and presented an bold and inquiring front. He erected his ears and turned th em toward us, stood firm on his leg, and looked as if he would "defy the devil." The sheep and lambs fled in terrible agitation and confusion. The swine early took alarm, and tried to run from us. When we overtook them, they endeavored, in an ecstasy of fear, to push themselves through the fences, if there happened to be any, or into the banks. The cows fled, but were speedily breathless, and gave up in despair. A huge brooding hen rose suddenly from her brood, and put herself in an attitude of defense, without moving a step. Another hen, without a brood, flew straight up into the air, in a paroxysm of fright. Fortunately none of these animals ventured on the railroad, and we arrived at Auburn, distance 26 miles, in one hour and ten minutes, without accident or detention. In a separate car were two stout, rascally-looking convicts, chained together, under charge of an officer, going to Auburn State Prison. They were merry and reckless, and came out at Halfway Station to have their last supply of tobacco and whiskey, before entering on the life of temperance that awaited them in jail. The cars upon this Road will run in connection with the Utica & Schenectady, and Syracuse & Utica Rail-Roads. Leave Auburn for Syracuse, at 3 o'clock A.M. and 2 o'clock, P.M.
Leave Syracuse for Auburn, at 9 o'clock A.M. and 8 o'clock, P.M. on the arrival of cars from the east. All baggage, at the risk of the owner. LEVI LEWIS, Superintendent. 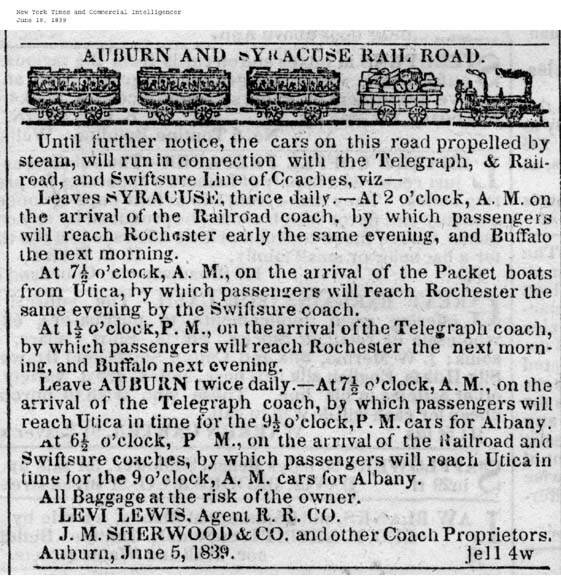 Coaches carrying the United States Mail will leave Auburn for Geneva, Canandaigua, Rochester, Buffalo and Niagara Falls, immediately on the arrival of the cars at Auburn, and also at 6 o'clock A.M. arriving at Rochester in 12 hours, and at Buffalo 24 hours. The Swiftsure coach for Rochester via Vienna and Palmyra, will leave Auburn at 11 o'clock A.M. and arrive at Rochester by 10 o'clock P.M.
Extras furnished at all times. J.M. Sherwood & Co., and Others, Proprietors. The directors of the Auburn & Syracuse Rail Road Company are untiring in their efforts to accommodate the travelling public. Accordingly, they have recently placed upon their road, one of the most commodious, and splendid passenger cars, we ever saw, and it is said, by those who have traveled over the principal rail roads in the Union, to excel in point of convenience and elegance, any car on those roads. The car is 33 feet, 4 inches long, with a platform of 3 or 4 feet in length at each end. It has two tiers of elegant cushioned seats, with moveable backs, each tier containing 15 seats, and each seat will hold two persons, 60 passengers can therefore be comfortably seated. It has on each side two tier of diamond shaped sliding windows, which give it a beautiful appearance, and, when open, allow a free circulation of air. It has a convenient aisle, or passage way running through the center, the entire length. It is placed upon 24 springs, and is supported by two pair of wheels at each end. It is most superbly painted, and appears to be constructed with durable materials and in the most substantial manner. It was manufactured by Mr. Stephenson at Harlem, and cost upwards of $2,200. If the company reap the reward to which efforts of the directors entitle it, it will be abundant. "My father's family [William H. Seward] were invited to one of the early trial trips on the Auburn & Syracuse Railroad. Col. John M. Sherwood, the stage proprietor, and his family occupied the adjoining compartment in the one passenger car. Another was improvised by putting the body of one of Sherwood's stages on a platform car. Thus equipped, and drawn by horses, we made the journey to Syracuse in what seemed the marvelously short time of two hours and a half. "A few months later more cars were obtained, and two locomotives, the 'Auburn' and the 'Syracuse,' which were objects of admiration and curiosity all along the line. The locomotive whistle was a novelty, and the boys were of the opinion that the engineer must have very strong lungs to blow it so loudly. To ride with him was a delightfully dangerous privilege granted to only a favored few." From: "Recollections of My Early Life in Auburn" by Mrs. Deborah Bronson. Cayuga county historical Society Publications Vol. 6, 1881. "The railroad was laid up Franklin Street [in Auburn] from the station near the prison, to the livery stable now occupied by Mr. Doan [site of Salvation Army on East Genesee Street], and those passengers who chose to do so, got off at the prison, while others preferred to ride to the terminus. 'The first cars were very small. They had doors at the side like a coach, and two seats facing each other, with places for six passengers in each car. There were usually three cars in a train and we were drawn by horses to and from Syracuse. It was at the latter place I first saw a locomotive, some time before one had been brought here. After the cars had begun to run with regularity the Auburn House was built and being near the railroad, it soon became a popular resort as passengers could get off at its door." The undersigned take pleasure in stating that yesterday afternoon they left this place in a train of seven cars, propelled by the new locomotive engine OWASCO, and from Auburn to Syracuse, a distance of 26 miles in a short time of 58 minutes, including all stoppages. The trip was made by Mr. Williams, Supt. The engine started with 80 lbs. pressure. This beautiful wrought and highly finished piece of machinery was built the past season in Auburn and reflects much credit upon its able builders, Dennis, Thomas & Wood. Ed note: This railroad was completed to Auburn in November, 1841. It and the Auburn & Syracuse were merged in 1850 to form the Rochester & Syracuse Railroad Company. It was consolidated into the New York Central in 1853. Passenger service discontinued May 18, 1958. Abandoned Victor to Pittsford in 1960; Canandaigua to Victor in 1978, and Pittsford to Rochester in 1982. Operated by Conrail, April 1, 1976 to July 1, 1995, when turned over to Finger Lakes Railway, along with remaining segment of Lehigh Valley mainline, about 15 miles, Geneva to Kendaia). Winding in and out, crossing streets in the western part of the city, close to the fire house of Engine Company 5, skirting the rear of Porter School, for a way paralleling Emerson Avenue, through a cut on the east side of Porter hill and over a fill between Chemung Street and Willis Avenue, runs the "old road." Railroad men still call the Auburn branch of the New York Central that, though not for several years have trains wound their way through what used to be Geddes. They go over the main line to a point near Solvay, and then swing back again to the "Old Road," and through Fairmount to the west. Now and then a freight with a car or two destined for a shop or factory in what was Geddes goes the winding way, or empties go that way to be filled, but that stretch of little used railroad represents the first over which trains ever came into Syracuse. The Auburn & Syracuse railroad was incorporated 98 years ago today. Another two years will make the centennial of its beginning. John H. Drake, who lives at 1744 West Genesee Street, remembers the "old road" better than any living man, for he is the oldest native-born resident of that part of the city which was Geddes before 1886, the year of its annexation. He was born 86 years ago, on May 14, 1846, in a fine old house still standing up there opposite the steel works on Emerson Avenue. Though the Auburn & Syracuse Railroad was incorporated in 1834, it was not opened until January 8, 1838, and then the cars were drawn by horses. It ran from Auburn to Geddes. Within a year, however, the road was continued to Syracuse, with a station in Washington Street, between Salina and Clinton streets. The Syracuse & Utica Railroad was opened July 4, 1839. The first wooden station was in Vanderbilt Square, thereafter also used by the trains of the Auburn road, engines having displaced horses. That station was pulled down February 26, 1869, and since that time trains have been pulling into practically the same location of the New York Central depot. The first railroad into Syracuse was the "old road" from Auburn, was opened only eight years before John H. Drake was born in the house by the tracks, over which an occasional engine still puffs its way with a light load for or from a west-end factory. Ed. note: The approximate three-mile stretch between Syracuse, and the east end of the old Allied Chemical plant in Solvay, was abandoned in 1961. No passenger trains had operated over this segment of the line since the early 1900s. I have been asked whether or not it is so that the first caboose was one devised on the Auburn & Syracuse Railroad about 1840 by "Uncle Nat" Williams, an old teamster. I don't think I want to touch that one with a 10-foot pole. I know one of the early headlights was made by the master mechanic, but this is a new one on me. I shy away from "firsts." Auburn and Syracuse Rail Road. Mr. Editor - Sir: Having had occasion the last few months, to pass over the A.& S. R.R. I beg leave through your widely circulated journal, to say that the gentlemanly treatment of the conductors, Messrs. Frink and Smith of the road, the perfect safety, and go-a headitiveness manifested by Grant & Smith, the engineers of the "Wyoming" and "Varnum," is a perfect guarantee to the passengers of pleasure and business, that when they are ahead all is well. I must also beg to say, that our friend Fargo, of the Freight Train is fully competent to discharge the duties pertaining to that department, to the entire satisfaction of the business community. My old friend A.G. Williams is one of the Railroad men, practically so; his long acquaintance and experience in building and relaying the road, the past season, is a source of pride to his numerous friends, and the public comment fully appreciate his forte, unless like your humble servant, he has rode on his road, and knows the men. Official Catalogue of the National Exposition of Railway Appliances. Chicago: May 24 to June 23, 1883. The Adams & Westlake Manufacturing Co. have a large exhibit of curiosities in Headlights, Car Lamps and Lanterns, among them the following articles: One of the first headlights used in this country, on the Auburn & Syracuse Railroad, is shown. The reflector was made of cast metal and in the shape now used, but in an accident a hole was stove through the apex. It was afterward cut off and utilized as a dish pan. The idea of using a parabolic reflector was conceived by M. W. mason, of Auburn, then superintendent of motive power of the above road, together with Allen Sweet, of Auburn, N.Y., and during the year 1838 Messrs. Nathan Rogers and William Wakeley, of Auburn, began the manufacture of headlights, using, as before stated, a parabolic reflector of cast metal. Death of a former Resident of Auburn. He was born in Cheshire, Berkshire County, Massachusetts, in 1805, and may be said to have led not only a busy but a useful life. Possessed of a natural mechanical and inventive mind, he early turned his attention to the devising of various improvements in machinery and to matters pertaining to the development of the practical arts. The greater part of his life was devoted to railroad interests, and few men were more widely known as among the earliest and most earnest promoters of that important enterprise. He commenced railroading in 1833 on the Newark, N.J., Railroad, with which he was connected five years, when he removed to Auburn, N.Y., and took a position on the Auburn & Syracuse Railroad as Master Mechanic, remaining in such position until 1850.